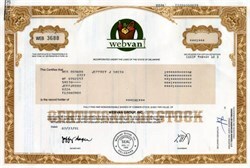 Beautifully engraved certificate from the Webvan.com . This historic document was printed by the Security-Columbian Banknote Company and has an ornate border around it with a vignette of the company's logo, a bag of groceries and the company's name. This item has the printed signatures of the company’s chairman and secretary. Jul. 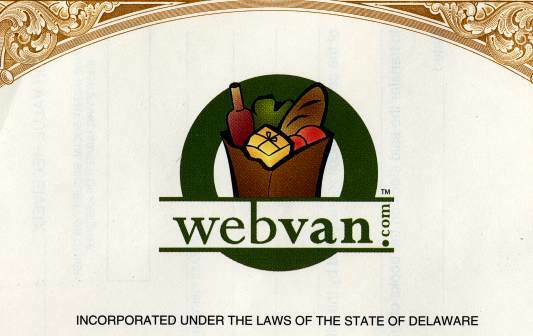 10, 2001 Webvan Group Inc., the online pioneer that aimed to revolutionize the grocery industry but ended up losing $830 million, ceased operations Monday and said it would file for Chapter 11 bankruptcy protection. The company's demise marks one of the biggest casualties of the dot-com bust and demonstrates how the Internet's entrepreneurial optimism often outstripped business realities. Webvan, which blew through more than a billion dollars without ever turning a profit, became the biggest Internet failure of all time on Monday, ceasing its four-state operations, firing 2,000 workers and saying it planned to file for bankruptcy protection. Webvan was an Internet retailer offering same-day delivery of consumer products, with an initial focus of food, non-prescription drug products and general merchandise. For the FY ended 12/31/00, net sales totaled $178.5M, up from $13.3M. Net loss totaled $453.3M, up from $144.6M. Results reflect the commencement of commercial operations in San Francisco and Atlanta, offset by higher personnel, amortization and restructuring costs.